Often our groups on the island get together for sunset while we gather for cocktails and conversation about another exciting day. Sometimes we watch it from the point, but this time of the year it is better to go out to the sandbar so you can see it hit the horizon instead of seeing it set behind the island. A few weeks ago we shuttled everyone out to the sandbar where we had chairs and snacks set up to go with island libations. 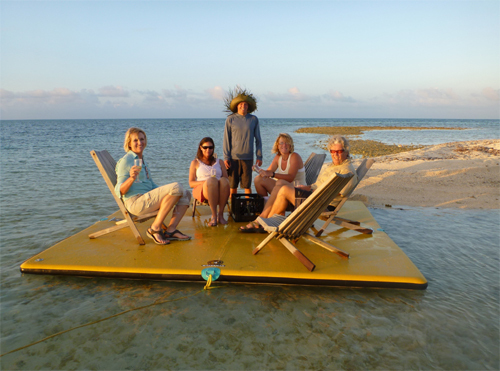 Last week we had a very small group so we set up a few chairs on our iMat (an inflatable pad we use as a float set up in our ‘harbor’) and Matt, our guide, towed 4 of us out to the sandbar using a paddleboard. We had a great party while the sun set over the calm seas. 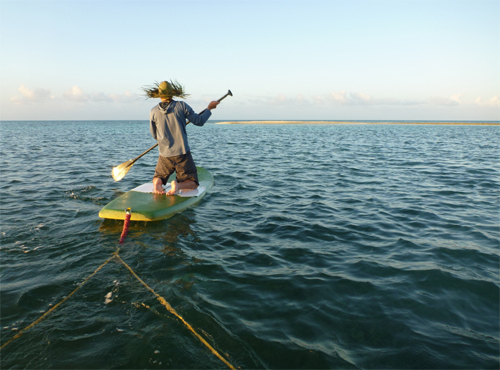 The biggest challenge was to make it back to the island (only 100 yards…) before it got dark!